The Precor EFX 5.37 elliptical crosstrainer is the company’s top-of-the-line residential model that compares in features and workmanship to their commercial products. The adjustable CrossRamp® and Variable Stride features allow you to work on all muscles groups of the lower body or target one specific area such as the glutes. 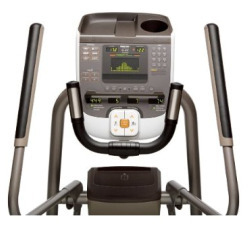 The Precor EFX 5.37 elliptical crosstrainer comes with a Touch Sensitive display to customize workouts. Programs include 2 HR, 2 Custom, Cross Training, Fat Burner, Fitness Test, Gluteal, Hill Climb, 3 Interval, 3 Weight Loss, and Manual. The Biofeedback center with SmartRate® provides dedicated readings on heart rate and calorie burn rate. UPDATE: The EFX 5.37 is an older model that is no longer available. You can check out all of the latest ellipticals here or compare older Precor models on sale here. Ever since the original crosstrainer with the patented ramp technology, the EFX 544, came out in the mid-1990s, Precors have been the standard-bearer for superior elliptical training. Precors provide a close simulation to natural walking and running thanks to a smooth, natural glide — the best elliptical motion in the industry, the one they invented and patented. These machines also give the user a low Relative Perceived Exertion or RPE rate, which means your body is working harder than you think. You are getting better results even though it seems easy to pedal the machine. The Precor EFX 5.37’s CrossRamp® adjusts from 15 to 40 degrees and also automatically adjusts your stride from 21" to 24.5" mimicking the feeling of an uphill climb. Called Variable Stride Geometry, this allows you to work all muscle groups in the trunk and legs, or specify one group, for example, the calves or the glutes. You can use the convertible arms for a Total Body workout, or concentrate on a Lower Body workout. One of our favorite commercial elliptical crosstrainers is the EFX 546i found in health clubs and we make comparisons in elliptical reviews based on that lofty standard, so it’s a lot of fun to compare a Precor … to a Precor. This professional level Precor EFX 5.37 elliptical crosstrainer is the same as the 5.35 model ($4,999) except it has a few more programs, a Tap Control keypad, and includes extras like a floor mat and two water bottles. Is it worth the extra $400 over the 5.35? Not really, unless you love to spend money needlessly. 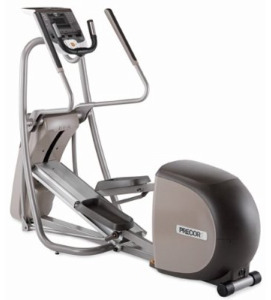 The Precor EFX 5.37 is a great elliptical crosstrainer but seriously overpriced for a home user. Here’s a way to gauge its value: if you pay $600 or more per year to belong to a health club, then consider it would take 9 years owning the 5.37 to re-coup the $5,399 price tag compared to paying a gym membership. Will you really get your money’s worth out of it? On the other hand, like many people you may want to upgrade your elliptical in 4 to 6 years. In that case, you should be able to sell your used Precor EFX 5.37 elliptical crosstrainer for roughly 1/3 of the retail price you paid for it. Or here’s another solution: we suggest that if you want a commercial quality trainer, check out a Remanufactured Elliptical Machine (they are re-built to be good as new) that sells for around $2,600.